Mobile is changing the way that people communicate, work and play, and much of the growing adoption and innovation we're seeing in the industry is driven by mobile apps. There are already more than 600,000 mobile apps on Google Play alone, and we expect to see continued momentum throughout the industry. Mobile is also becoming front and center for marketers and businesses. As more of them understand the value of mobile apps, sophisticated measurement tools are becoming core to how marketers and app developers invest, analyze and market their apps. 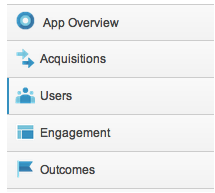 New and active users - measure the number of new and active users who launch your app everyday and analyze your most valuable segments. Google Play traffic sources - understand which traffic sources are driving new users and in-app conversions through Google Play to fine-tune your marketing initiatives. App versions - keep track of the distribution of active users over the older and newer versions of your app so you know what to support. Device overview - check out the top mobile devices and OS versions that your app runs on, and optimize the experience for each device. User behavior - assess how loyal your users are, how frequently they use the app, and the engagement level of each loyalty group. Engagement flow - visually see the screens, actions and paths users take to move throughout your application in order to optimize usage. App crashes - see trends in crashes and exceptions that will help you troubleshoot problems on certain devices and operating systems. Goal conversions - set up conversion events in your app, like spending 10 minutes in the app, or clicking on ads to gauge success. In-App purchases - if you sell virtual or tangible goods in your app, you can measure the number of purchases and the revenue generated. The new reports are part of a holistic experience tailored for mobile app measurement, including a new and lightweight SDK v2.0 that’s easier to implement and is opt-out ready, with a streamlined back-end infrastructure. We’ve also revamped our sign-up process, so new users can choose whether they want to start measuring their website or their mobile app. This means you’ll be just 3 clicks away from setting up your app analytics account and downloading the SDK. We will be opening the beta up to whitelisted users in waves, so if you’re interested in using Mobile App Analytics for your app, please complete this beta signup form and we’ll get you started soon. 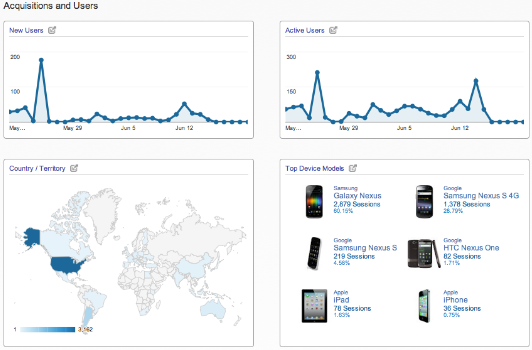 We anticipate the reports will be available to all Google Analytics users by the end of the summer. Also, if you are at Google I/O be sure to attend the Google Analytics session “Measuring the End-to-End Value of Your App” (from 11:30AM - 12:30PM today, June 29) where our lead engineers will tell you more about Mobile App Analytics and some other exciting things we’re working on.